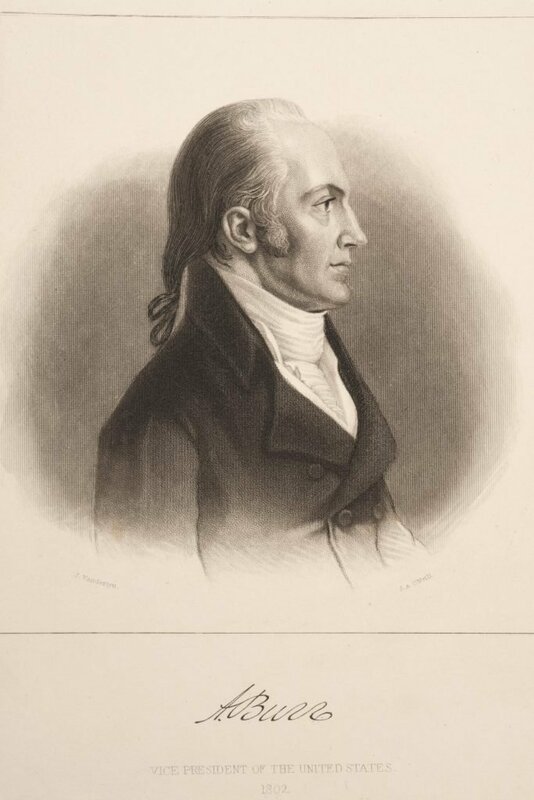 Aaron Burr, 1836, Parker George & Vanderlyn John, Print, Fenimore Art Museum, Cooperstown, New York. N0048.1983. Aaron Burr was born in New Jersey in 1756. His grandfather was an influential preacher named Jonathan Edwards and his father was the president of what is now Princeton University. Burr was one year old when his father died and his mother died a year later, at which point he was raised by his grandparents who also both died within the year. He and his siblings were eventually taken in by their uncle in Philadelphia. Burr enlisted in the Continental Army during the Revolutionary War, taking part in many expeditions and battles and eventually becoming a lieutenant colonel. At the battle of Monmouth in 1778 Burr suffered severe heat stroke and his health never recovered. He left the Army in 1779 and began practicing law in New York City, very near to where Alexander Hamilton established his law office. In fact, they often found themselves defending opposite sides of the same case. In 1791, Burr ran for U.S. Senate from New York against the incumbent, Philip Schuyler, who was Alexander Hamilton’s father-in-law. He defeated Schuyler and served until 1797. His two runs for U.S. president in 1796 and 1800 were unsuccessful, although he became vice-president to Thomas Jefferson in 1800. (At the time, the runner-up in the race became the vice-president, differing from the current system wherein each candidate selects their own running mate). Jefferson greatly disliked Burr and removed him from his ticket in the 1804 election, at which point Burr ran for governor of New York and lost badly. He blamed Alexander Hamilton in part for launching a smear campaign against him, and eventually Burr challenged Hamilton to a duel after he refused to deny statements he made against Burr’s honor. Hamilton was subsequently killed. Burr was still vice president at this point and his murder charge was never tried. After the vice-presidency Burr traveled to the Louisiana territory and attempted to steal a large amount of land and establish himself as the ruler. Thomas Jefferson issued a warrant for his arrest declaring Burr a traitor, but in court he was acquitted of the charges due to lack of evidence. Burr escaped to England from 1808 to 1812, whereupon he returned to New York City to practice law again. He died in 1836 in relative obscurity.